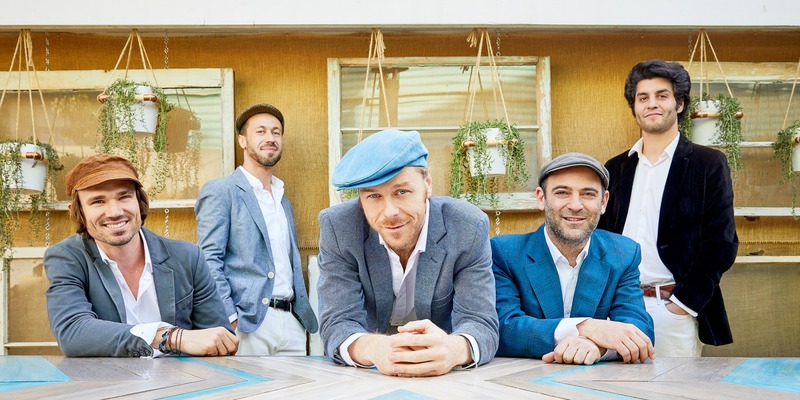 The Honeydrops have come a long way since guitarist and trumpeter Lech Wierzynkski and drummer Ben Malament started busking in an Oakland subway station, but the band has stayed true to that organic, street-level feel. Listening to Lech sing, it can be a surprise that he was born in Warsaw, Poland, and raised by Polish political refugees. He learned his vocal stylings from contraband American recordings of Sam Cooke, Ray Charles, and Louis Armstrong, and later at Oberlin College and on the club circuit in Oakland, California. With the additions of Johnny Bones on tenor sax and clarinet, Lorenzo Loera on keyboards, and Beau Bradbury on bass, they’ve built a powerful full-band sound to support Wierzynski’s vocals. More like parties than traditional concerts, their shows feature extensive off-stage jamming and crowd interaction. “The whole point is to erase the boundaries between the crowd and us,” Wierzynski says. “We don’t make setlists. We want requests. We want crowd involvement, to make people become a part of the whole thing by dancing along, singing, picking the songs and generally coming out of their shells.